OS grid reference: SD 8809 3014. Also called Holme Stone Circle. On the moors, just to the east of Mereclough, and close to the Long Causeway is the 290 foot hill known as Mosley Height. At the northern edge of the hill, close to Causeway-side Farm, stood a Bronze-Age burial mound, ring cairn or cairn circle. Some historians and archaeologists have gone as far as saying this was a stone circle, but many of the 18 stones that were found here have now gone, though some were still here in the 1970s. A disused open-cast coal pit/quarry occupied most of the Mosley Height site, with just a few traces of the cairn at the edge of the former workings, but the quarry itself is now grassed over. The ancient site was thoroughly excavated in 1950 and, more recently in 2009-10, at which time the site yielded many grave-goods and interesting artefacts from 3,000 B.C. And, at the south-western side of Mosley Height, beside the Long Causeway, there’s a Bronze-Age standing stone which is, perhaps, rather misleadingly called ‘Stump Cross’. Could this stone have come from Mosley Height Cairn Circle? Mosley Height Bronze-Age Urn, Mereclough. (Photo: Burnley Central Library). The site at Mosley Height, near Mereclough, is nearly 1,000 ft above sea-level. There was a circular embankment 42 feet in diameter with 4 burial cists. It was excavated in 1950 by a local archaeologist, Mr W Bennett, at which time a number of grave-goods and other artefacts were found. The reason for the archaeological dig was because the coal board were about to build an open-cast mine at the site. Among the artefacts discovered were many bone fragments, flints, a stone with markings or patterns, arrow-heads, stone hammer heads and deposits of galena (lead), but probably best of all, 2 collared and inverted cremation urns of the Pennine type and 1 fragmentary collared urn. Some coins were also found here though these were more recent in date. Four circular pits were excavated where the burials had lain, one of which was unurned. These artefacts, dating to 3,000 BC, were taken to Towneley Hall Museum at Burnley, and put on display there. It seems likely that a Bronze-Age settlement had once stood here, or close by. The nearby Long Causeway was probably being used by ancient tribes as a trackway between their settlements. In 2009-2010 another exca-vation was carried out by UClan but very little of any antiquity was found apart from a barbed and tanged arrowhead. Barrowclough, D., Prehistoric Lancashire, History Press, Stroud, 2008. Bennett, W., Report on Excavations near Burnley. Transactions of The Lancashire and Cheshire Antiquarian Society, 62: 202-208, 1951. Hall, Brian., Burnley (A Short History), Burnley and District Historical Society, 1977. 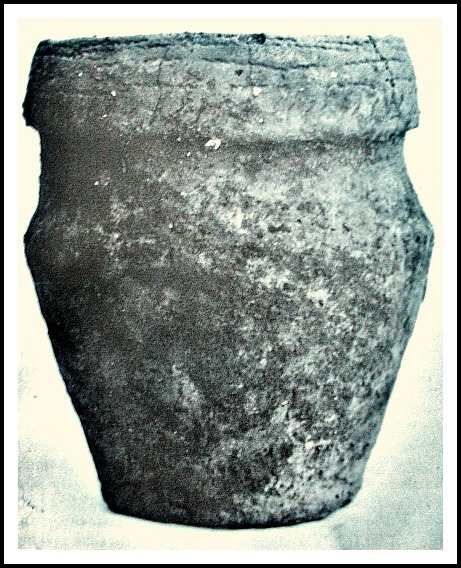 Lancashire Archaeological Bulletin, Vol. 10, No. 2/3 (May & June, 1984). Marsden, Barry M, Discovering Regional Archaeology – North Western England, Shire Publications, Tring, Herts, 1971. © Ray Spencer, The Journal of Antiquities, 2012 (up-dated 2019). Categories: Burial Mound, Mosley Height Mereclough | Tags: Mosley Height Burial Mound near Mereclough in Lancashire | Permalink.